This Sunday (that's tomorrow) the newest trailer for one of the biggest games in recent years, Mass Effect 3, will debut. Chances are that you would have seen it even without a reminder as the spot is scheduled to air during the mid-season re-activation of AMC's The Walking Dead. Dead is expected to pull in a mind blowing 10 million viewers this Sunday at 9pm EST- the trailer will be broadcast at some point during the show. 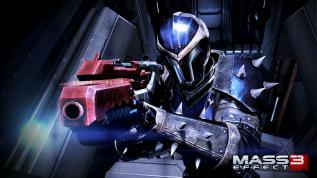 We know you're probably chomping at the bit for anything ME3 related, so here's a teaser for your viewing enjoyment. Yes, it's a teaser. For a trailer. And it's awesome.